Home / History / Celebrate National Barbershop Quartet Day – April 11Become A Member! Barbershop is fun to watch, but even better to DO! Whether it’s the Barbershop Harmony Society for men or Sweet Adelines International and Harmony, Inc. for women, there’s probably an opportunity to sing along right in your own backyard. Barbershop has gone global, too… with affiliate organizations all over the world. If you’re already part of an organized quartet (or larger group), take your show on the road! This is a day to sing out loud and proud, so seize the moment to stage a local performance or a surprise pop-up concert in your community. 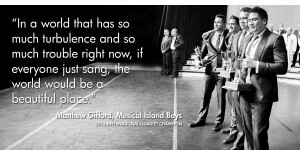 This could also be a great time to plan an event with your local choruses and quartets – plan a joint rehearsal, throw a tag party, or just get together to celebrate Barbershop. While you’re at it, take a minute to look around and appreciate the path from 1938 to the present. Honor and listen to the longtime Barbershoppers tell “how it used to be.” Invite your singers to share stories about their Barbershop beginnings. Every day is better with barbershop, and #barbershopquartetday is the perfect time to share your favorite quartet performances from our YouTube channel. Post photos of your first quartet, your current quartet, or your favorite quartet picture on Facebook, Twitter, or Instagram! 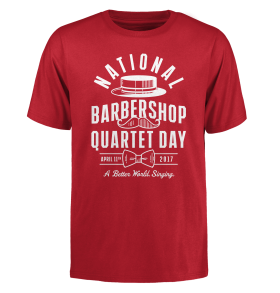 Make sure to tag everything with #nationalbarbershopquartetday and give some Likes and Shares to others. 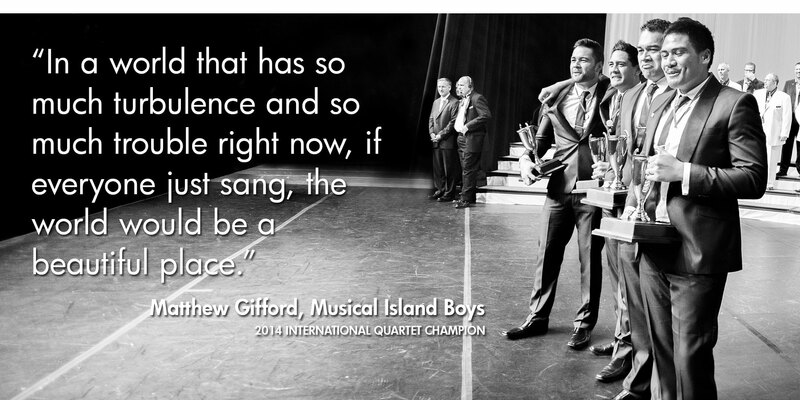 Let’s fill up our social media feeds with some Barbershop Quartet Day awesomeness! Sharpen up your Barbershop Quartet Day look with handsome new tees from Harmony Marketplace. Watch and hear the sound evolve in David Wright’s landmark History of Barbershop Class from Harmony University online. Trace the historical roots of the barbershop musical form. Classic articles from The Harmonizer unfold the origins of close-harmony in African-American communities.